Why not decorate your classroom or child's bedroom with mobiles they have made themselves! We've got a varied collection of mobile ideas here, including a number of printable mobiles - which just need cutting, sticking and hanging - and some lovely crafty projects. You will find two copies of each animal, one reversed. Cut out carefully and then glue back-to-back, sandwiching a length of thread between them for hanging. Here's a bunny mobile to print, cut out and assemble with your kids - a fun activity for Easter. There are 8 different funny bunnies in total, but which one is the Easter bunny? Here's the perfect mobile for children who love cats! Print out this 4-page pdf file. Cut out the shapes carefully, then match them up in pairs and glue them together back to back, sandwiching a length of fishing line or thread between them. Print out this mobile of all the animals of the Chinese Zodiac. Younger kids can cut out the animals using our simplified lines; older children might like to cut the real outlines. Glue the animals back to back, trapping a length of thread between them. Suspend and admire! Print, cut out, glue and hang this very cute dog mobile - there are 6 different pooches to entertain you as they drift in the breeze! Print this delightful farm animal mobile for some cutting and sticking fun with the kids. Each animal has two versions - one reversed - so that you can stick them back to back, trapping a piece of thread in between from which to hang the animal. This colourful fish mobile is a fun cutting and sticking activity for children. Cut out each matching pair of fish and then glue together, trapping a piece of thread behind them. Perfect as a nursery or playroom decoration! Guest Post - Making Mobiles! My daughter and I recently spotted the Twirly Heart Mobile on the website and thought it looked so sweet so we just had to give it a go. This 3D pumpkin mobile makes a fun decoration for the house or classroom at Halloween, and kids can use their imagination to paint some good gruesome faces on the "jack o' lanterns" if they wish. This stylish mobile makes a great Fourth of July project for crafty kids, and a decoration which you will be proud to display for your celebrations. This maple leaf mobile is an excellent Canada Day craft for kids, who will enjoy cutting out and assembling the maple leaf shapes from our template. Paint and decorate a paper plate before magically transforming it with a pair or scissors into this paper plate snake mobile! This is always a popular craft with younger children. All you need are some while paper plates, paint and patience to put together this clever phases of the moon mobile. Not only does it look great, but by the time the kids have coloured in the plates and assembled the mobile they should certainly understand how the phases of the moon work! You will find two copies of each of our five pretty pink animals, one of each animal reversed. Cut out carefully and then glue back-to-back, sandwiching a length of thread between them for hanging. Cheer up your outlook with a collection of cheerful tartan Scottie dogs! Using a paper plate for the "mobile" element of our Scottie dog mobile made this a quick and easy way to display our collection of Scotties. Make this gorgeous skeleton out of your old cardboard boxes - fun and recycling all in one! Here's a quick and easy snake mobile printable craft for kids - perfect for the Year of the Snake or to make during a snake or reptile project, perhaps. There are six snakes in total to cut out and stick back to back. Use this printable template to make a star and crescent moon mobile. 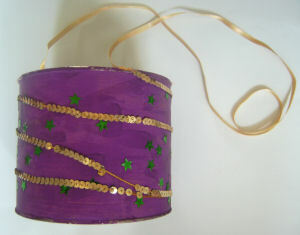 This would be a quick and easy craft for Eid (or perhaps a space theme). Scrunching up tissue paper is always a great activity for younger children, who will also enjoy the stickiness of sticking it to the paper plate. This mobile looks colourful hung up "in the sky" and will illustrate how we change from sun in the daytime to the moon at night.